Beets and their cousins all descended from the sea beet, a wild seashore plant grown throughout southern Europe, which has been eaten since prehistoric times. Beets have been used since ancient times for medicinal purposes. Today, it is newly appreciated for its anti-cancer properties and its cholesterol-lowering ability. 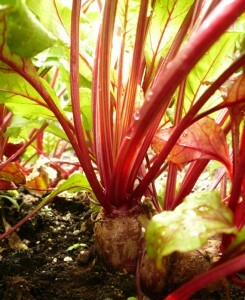 Common beets are deep red because they contain betacynanin, a powerful dye which could stain things a brilliant magenta. The table beet is one of four types belonging to the species Beta vulgaris. The others are sugar beets, grown as a source of sugar; mangel, used as feed for livestock; and chard, which is grown for its edible leaves. Gardeners grow beets not only for its edible root but also for its delicious leaves. Beet greens have the flavour of spinach but are not readily available unless you grow your own. A simple way to prepare the greens is to boil them for a few minutes, then drain well and serve with butter or olive oil. 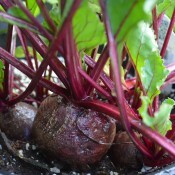 Beets are one of the easiest vegetables to grow. To grow into plump and tender roots, beets need full sun and well-drained soil rich in organic matter, with a pH of 6.5 to 7.5. Remember, insufficient moisture makes beets tough and stringy. Beets are an excellent companion plant to beans, cole crops (broccoli, brussels sprouts, cabbage, etc. ), and swiss chard. Beets are an excellent provider of potassium. The leaves are extremely nutritious, being very high in vitamins A and C, and have more iron and calcium than spinach. Beetroot can be harvested at any stage, even when they are tiny. Most varieties are at their sweetest and most tender when the roots are small – about the size of a golf ball. You can let them grow bigger, but careful not to let them get too large as they will taste earthier and take longer to cook. As for the beet greens, tiny leaves can be picked for salads; larger ones can be used like chard. If you cut them off, they will bleed. If picking leaves for salad or stir-fries, twist the foliage off and leave a few leaves in the middle. Refrigerate in a plastic bag. Beets will keep for about three weeks.